To avoid needless duplication of images, pictured here are some reference recordings utilised in the main entries. 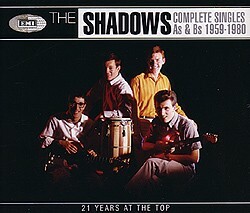 (i) For the most part, the standard Ventures and Shadows vinyl LPs cited as initial releases have CD derivatives with identical titles, and so are not specified here: they can be found in the series (chiefly "2 on 1" issues or "twofers") marketed by One Way Records (US), usually with two or three extra tracks tacked on, and See For Miles (UK), while Magic Records (France) has put out some Albums singly in digipak form with some notable bonus tracks. 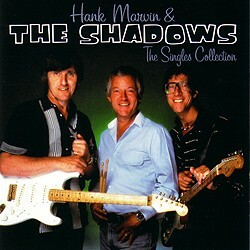 For further information on all of these see Driving Guitars pp.8-11. 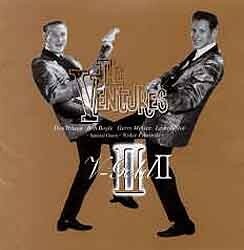 (ii) Many of the primary Japanese issues of Ventures albums are now exceedingly hard to find. Where appropriate, later, more easily obtainable, CD sources are cited. CD V-Gold (Japan), May 1999: 'Walk, Don't Run', 'Apache', 'Perfidia', 'Telstar', 'Slaughter On 10th Avenue'. 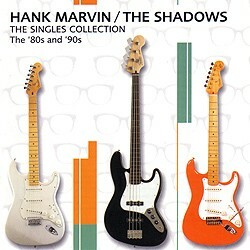 CD V-Gold II (Japan), June 2000: 'Sleepwalk', 'Raunchy', 'Riders In The Sky', 'Memphis'; also 1964 styling of 'Walk, Don't Run'. 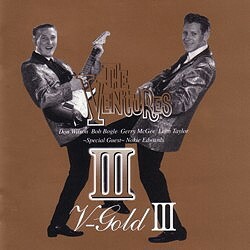 CD V-Gold III (Japan), May 2001: 'Guitar Boogie (Shuffle)', 'Nut Rocker' ('Nutty'), 'Honky Tonk Women'. 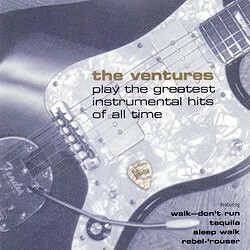 CD The Ventures Play The Greatest Instrumental Hits Of All Time, 2002: 'Walk, Don't Run', 'Apache', 'Sleepwalk'. 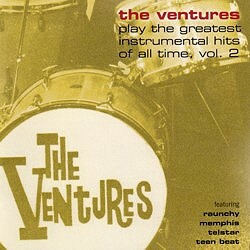 CD The Ventures Play The Greatest Instrumental Hits Of All Time Vol. 2, 2003: 'Raunchy', 'Telstar', 'Memphis'; also a version of 'Exodus'. 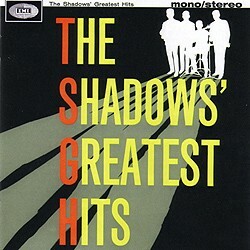 A number of the re-recordings in question here were included in a bargain 3CD Box, Walk Don’t Run, on the Castle Pulse label (2004): 'Walk, Don't Run' (two versions), 'Apache', 'Perfidia', 'Sleepwalk', 'Raunchy', 'Guitar Boogie (Shuffle)', 'Riders In The Sky', 'Telstar', 'Memphis', 'Nut Rocker' ('Nutty'), Maria Elena', 'Classical Gas', 'Exodus', 'Time Is Tight'. 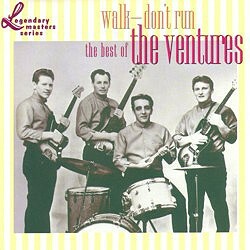 (iv)(a) CD sources for Ventures singles are given under the appropriate entries, excepting four titles, which are conveniently available on the 1990 CD Walk Don’t Run – The Best Of The Ventures: Legendary Master Series, EMI USA. 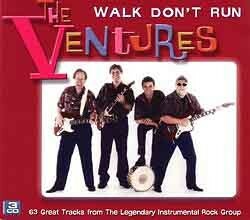 These are: 'Walk, Don't Run' together with the 1964 remake, 'Perfidia', 'The Savage', 'Slaughter On 10th Avenue'.